Situated right across the walking street from Pizzeria Bianco in downtown Phoenix, one has to wonder how many patrons of The Rose and Crown are people who tired of waiting for Pizzeria Bianco and decided to eat at the next closest place. We ended up in a similar situation, in which a reservation miscommunication led to us without ample room at the pizzeria. So off we went to The Rose and Crown for some British Pub food. A quick look at the menu revealed that this was no ordinary British Pub and it actually had some unique-looking options. One of these unique-looking options was Poutine. If you know my blog, then you know I have a bit of an unhealthy obsession with poutine. I’d blame this on my Canadian ancestry, but I find no need to make excuses for fries topped with gravy and cheese curds. The poutine at The Rose and Crown was a little different than your typical poutine, signifying some sort of fusion between British and Canadian food. 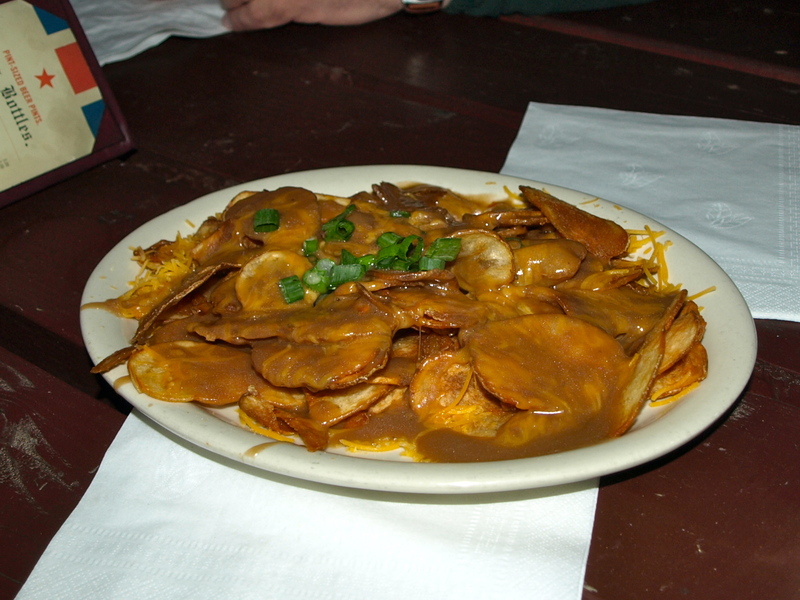 For starters, although I had taken the term “chips” on the menu to be Britspeak for fries, when they arrived, they really were homemade potato chips. Also, instead of cheese curds, this poutine was topped with shredded cheddar. While I appreciated the attempt at innovating poutine, it fell a bit short in the flavor and texture land. Seriously, no curds? I followed up this appetizer with, surprise, a burger. This thing went by the name of The Crown and was topped with cheddar, bacon and a fried egg. Similar to my obsession with poutine, I am also obsessed with fried egg as a burger topping and couldn’t wait to get this thing. But first I had to order. It came with lettuce, tomato, pickle and onion, which I rapidly dismissed as I also attempted to order my burger medium rare. Sadly, I was told the best they could do was medium. It also came with a side of fries or slaw and I most certainly went with fries. The burger turned out to be quite a beauty, with a shiny bun and real fries to accompany it. 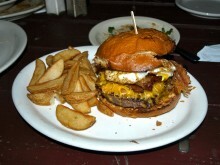 As I ate the burger, I delighted in the perfect crispiness of the bacon and the flavor provided by the fried egg. The cheddar was as expected and although the bun had a hard time holding its own against the weight of so many toppings, it had the support of a toothpick and lasted throughout the noshing. Also, it was tasty. The meat itself, though, was a bit of a disappointment. I don’t know if it was the extra cooking or a bad choice of beef, but I found it to be a bit drier than I would have preferred and lacking in delicious flavor. It wasn’t bad, but just could have used a few tweaks. And to end on a high note, the fries were great and really should have been used in the poutine instead of those gravy-sucking chips. In the end, The Rose and Crown delivered most of the goods. A few changes here and there would have me singing their praises and commanding all Phoenicians to skip the line at Pizzeria Bianco and head to The Rose and Crown instead, but without those changes The Rose and Crown is just an above average British Pub.